Happy Curious: The Veg Mom PH's The Good Choices Are Indeed Good! The Veg Mom PH's The Good Choices Are Indeed Good! Going healthy and standing by your choices can be hard when you're a vegetarian or vegan going thru the grocery isles. There will be meat-free options available but the number one complaint of people trying to eat healthy is that most meat-free options can be pricey. 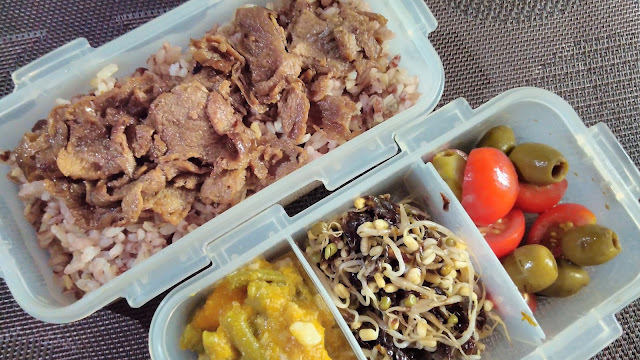 The Veg Mom PH's The Good Tapa is the star of my bento lunch box. Luckily, local businesses have come up with healthier and more affordable meat-free products. 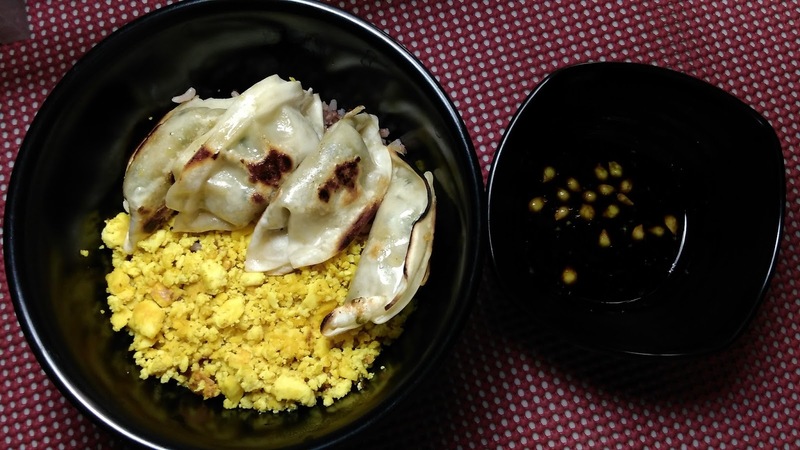 One local business is The Veg Mom PH offering meat-free alternatives to some of our popular Filipino dishes. Their first offering is dubbed The Good Choices which include The Good Tocino, The Good Longganisa and The Good Tapa. Before I ordered the The Good Choices, I saw on my newsfeed that were also offering Tofu Scramble so I ordered this as well. I made the order through their Facebook page and visited The Vegetarian Kitchen for pick-up. I was excited to have a taste of all this food but I took a look at what's inside before deciding on what to taste first. Here's a snap of how everything looked before cooking. 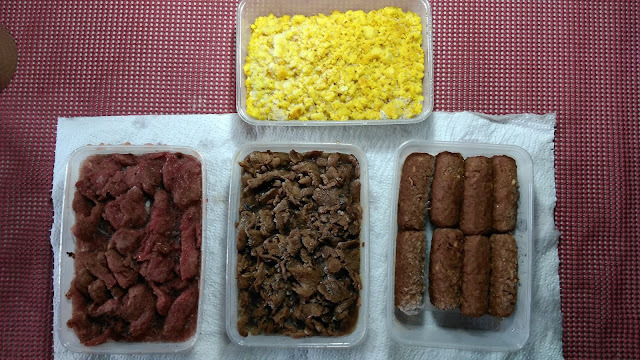 Top: Tofu Scramble, L-R: Tocino, Tapa, Longganisa. Still frozen but all ready to cook! The products looked like the real thing, even the color. The are also all ready to cook so no need to thaw. You can just take them out of the freezer and straight to the fry pan. I decided to try out the Tofu Scramble first. I had tried making my own tofu scramble before but I couldn't always get the spices and the taste right. This was no problem with a ready-to-cook alternative. I didn't expect it to taste like egg of course, but it definitely tasted better than what I could come up with on my own. It still had the crumbly texture, the right color and was very flavorful especially when paired with the calamansi and soy sauce dip. It is a filling meal alone or with other dishes. I liked tocino before but aside from being too sweet for my taste, I didn't like that some brands were hard to chew. It's always hit and miss when buying tocino but The Good Tocino was a hit all the way! 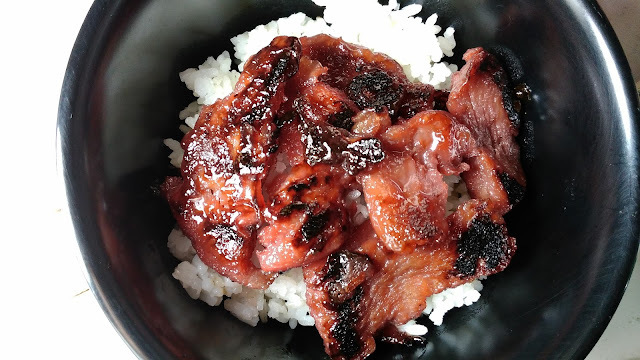 The Good Tocino on top of a bowl of warm rice. From the texture alone, you wouldn't know this wasn't meat. The chewy but soft texture was just right; it almost melts in your mouth. The sweetness was just right as well and the burnt spots you get from caramelization when you cook tocino was also there. Best of all, it is vegan. It has the red tint of your regular tocino so you'll never get pale-looking tocino again. If you love your tocino, you'll love this healthier and meat-free alternative. 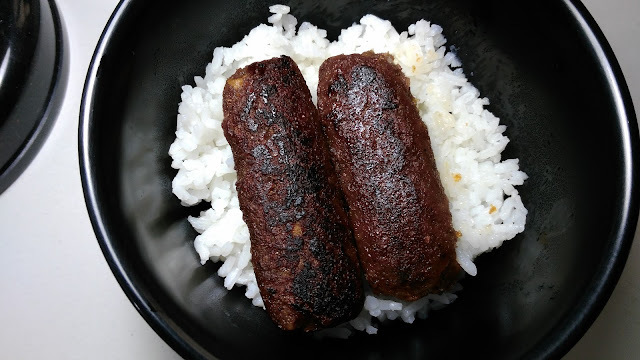 I had never been a fan of longganisa because I found them either too oily, too fat or too sweet. I don't like biting into large fat nodules while chewin so I just generally don't opt for them when I have other choices. The Good Longganisa is an exception to that. The Good Longganisa will be a guiltless treat. You might find the texture too soft but just handle it gently while uncooked and fry on all sides to get the outside crispy. It is dark brown when cooked but I left mine a bit too long on one side thus I had some burnt areas. Burn areas aside, the texture is softer than meat longganisa but I appreciated it more as it was easier to chew and I didn't have to experience the feel of nodules of fat as I chewed. Plus! It is actually tastier; not too sweet or salty but just right. If like me, you also don't like biting into big chunks of garlic, then this is the longganisa for you. My favorite of the The Good Choices is The Good Tapa. I found this to be the most versatile out of all the 3 products. This would give meat tapa a run for its money. The thin slices gave it just the right texture and you won't ever get tough tapa like you would with the meat version. 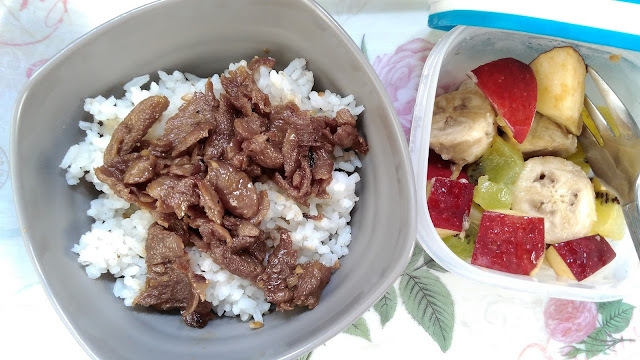 The Good Tapa with Rice and fruits on the side. The marinade alone smells delicious and when already sizzling in your pan, you can eat it as is or you can turn it into other things. Some people made Bistek Tagalog out of it and you can use it instead of bacon for your salads or pastas because it tastes so delicious. The Good Tapa over brown and red rice + Curried Beans and Squash + Mungo Sprouts and Nori + Tomato and Olives. My bento lunch box above (1st picture on this post) has The Good Tapa over brown and red rice with side dishes of boiled pechay with soy sauce; sauteed carrots, potatoes and green peas and the last item is boiled carrot, potato and cucumber salad. For my next order, I am inspired to put this in a "pulled pork" sandwich but as the pork replacement. I can think of a lot more things to do with this stuff so I will be stocking up on this for sure. If you're trying to eat healthy and looking for meat alternatives, then The Good Choices are highly recommended. Not only are they affordable but they do not sacrifice taste for price. I mostly paired mine with just plain rice in the pictures but I did have some side dishes with them. 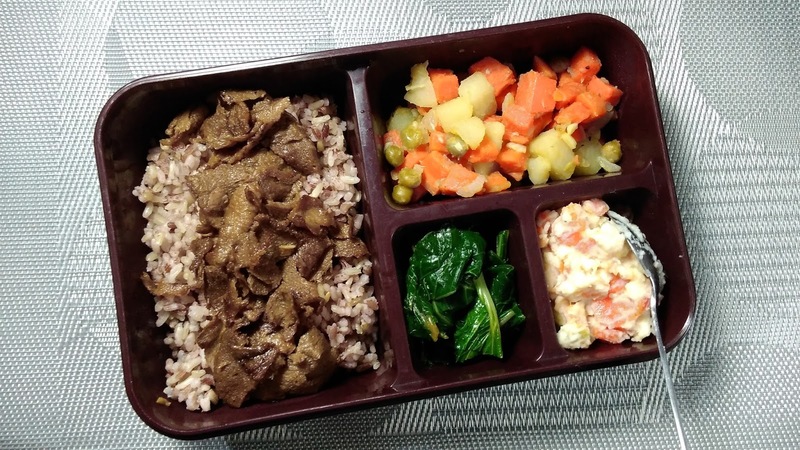 You could have them with just rice because they taste so good on their own but they would be healthier with more veggies and fruits on the side just like I did with my bento boxes. The Veg Mom PH's The Good Choices are indeed good choices. Now you won't have to feel guilty when you're craving for tapa, longganisa or tocino. The Good Choices makes choosing to eat healthy a lot more affordable and easier. They are now offering Sisig and other items. I am looking forward to tasting their new delicious creations and hope that they come up with more meat-free product offerings. For more information, visit The Veg Mom PH Facebook page where you can pm your orders. They also allow for pick-up at their resto The Vegetarian Kitchen or you can have your orders delivered.